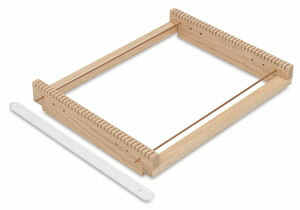 The Todd Loom is a great loom for teaching the elementary principles of weaving without heddles. It includes a shuttle and instructions. The loom measures 10" x 12" and has a maximum weaving width of 8-1/2". Choose from an adjustable or a non-adjustable oak wood frame.